Nyja Horton, a 39-year-old single mother of two, has received $18,000 over the 12 years she has been eligible for the Earned Income Tax Credit. NEW YORK (CNNMoney) -- Many of the people who could use a little extra money the most are missing out on a tax credit worth up to nearly $6,000. Aimed at helping the working poor, the Earned Income Tax Credit lifts millions of Americans out of poverty each year, yet one in five taxpayers eligible for the credit doesn't end up claiming this extra windfall. That's a big loss, because the credit is one of the largest the IRS provides. The Tax Policy Center has found that it is the second largest cash assistance program for low-income families in the country -- after the government's food stamp program, which doled out nearly $72 billion in benefits last year. By claiming the EITC, nearly 27 million taxpayers received about $59.5 billion from the credit in 2011, with refunds averaging $2,240, according to the IRS. These payments helped an estimated 6.3 million people escape poverty in 2010, according to the most recent data from the Center on Budget and Policy Priorities. About half of those people were children. The government defines the poverty threshold as having an annual income of under about $11,000 for an individual and about $22,000 for a family of four. "For people earning minimum wage, having enough money to get by can be really problematic," said Michael Saltsman, a research fellow at the Employment Policy Institute. "This credit is not only reducing poverty, but stimulating employment, so there's definitely an increased effort on the part of the government to let people know it's out there." How it works: Since the EITC is refundable, claiming it lowers the total amount of taxes owed and can result in a refund if the amount of the credit exceeds the tax liability. This essentially allows low-income earners to hold on to more of the money they earned during the year instead of forcing them to give it all back to the government in the form of taxes, said Saltsman. To claim the credit, the taxpayer must have a job and their income must fall under certain thresholds. The credit amount increases with the number of children claimed as dependents. For the 2011 tax year, single filers earning $13,660 or less who have no children are eligible for credits of up to $464, while married filers with income of less than $49,078 and single filers reporting income of under $43,998 who have three or more qualifying children are eligible for credits of up to $5,751. Nyja Horton, a 39-year-old single mother of two who earns $28,000 working full time as a manager at a nonprofit, found out about the credit from a TV commercial. Over the course of 12 years, she estimates she has received a total of $18,000 by claiming it. "I was very surprised and very grateful when I found out how much I would get," said Horton. 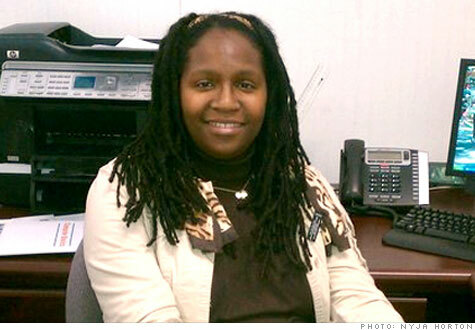 "It meant I didn't have to keep stretching paycheck to paycheck." With the money from the credit, she has been able to grow her savings and even take a few family vacations. Last year, she put the $1,800 she got back toward a 2005 Honda Accord, a purchase that came in handy after her previous car was totaled in an accident. Not only does the tax credit help put extra money in the pockets of low-income workers, but it also encourages people to at least find part-time jobs in order to qualify, said Saltsman. Those who claim it should be careful, however. Because of the large amounts of money being doled out, the credit is a big target for fraud. The Government Accountability Office, a division of Congress that examines IRS procedures, estimated that the IRS made about $15.2 billion in improper EITC payments. This is due in part to confusion about eligibility, but some preparers also fraudulently overstate the amount that a taxpayer qualifies for or file claims for unqualified taxpayers. And identity thieves often pose as EITC recipients to cash in on the credit. As a result, the audit rate for taxpayers claiming this credit is typically about twice the average audit rate, according to IRS data. Why are so many people missing out? Often, the people who qualify for the EITC have such low incomes that they aren't required to file their taxes and have no idea that they could benefit from the credit, said Vincent Consenza, CPA at accounting firm Shanholt Glassman Klein Kramer. In addition, people who get their hours cut or go from full-time to part-time or freelance positions don't always realize when they have become eligible for the credit, since they have never claimed it before. To help get the word out, the IRS is adding information to its website, sending out fliers and putting up posters. The agency has also partnered with companies like New Orleans-based energy provider Entergy, which has 2.7 million customers -- 20% to 30% of whom are at or below the poverty line. Entergy is helping the IRS spread the word about the EITC by sending out 2.2 million statements to customers with their bills, issuing press releases, holding free workshops and putting up yard signs. Thanks in part to these recent publicity efforts, at least 9,000 Entergy customers received more than $12.9 million in refunds last year. "With the country in such economic strife, whatever amount of money they're able to claim through this tax credit is a benefit," said Rod West, executive vice president at Entergy. He said a number of customers at or below the poverty line are spending a huge portion of their income on energy bills. To find out if you qualify for the EITC, the IRS website has a tool you can use where you enter basic information about your tax situation. TurboTax's smartphone app, EITC Finder, also helps you determine if you're eligible.